A friend of mine introduced me to making porridge with glutinous purple rice, and ever since then, I would buy a small pack whenever it makes its sporadic appearance in the supermarket. 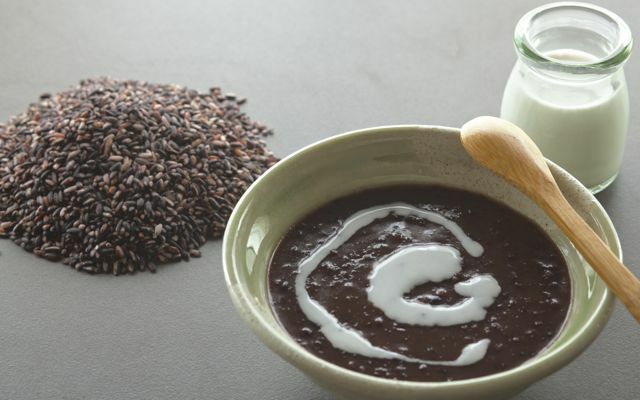 The high amount of amylopectin is responsible for its sticky quality – yielding a thicker and richer porridge compared to one made with regular rice. As I was preparing to cook some glutinous purple rice last month, I remembered reading somewhere that rice water, or the water used for washing rice, was good for the skin and has been used by Chinese and Japanese women for centuries. Without doing much research, I went ahead and soaked rice in distilled water at a 1:1 ratio. I also had some shikon roots going through a second infusion. It was much lighter than the first infusion so I thought if I used it together with the purple rice water, I might get a lavender-colored soap. Wanting to keep things simple, I decided to use these 2 ingredients in my 2-oil Fil-Castile formula. And instead of my usual unscented Fil-Castile, I added essential oils of lavender and rosewood (all-natural blend since the real thing is endangered and too costly.) At the last minute, I added bamboo charcoal to have some kind of design for the top. I finally got to test a bar a few days ago. It was slimy, pasty, and barely bubbly. 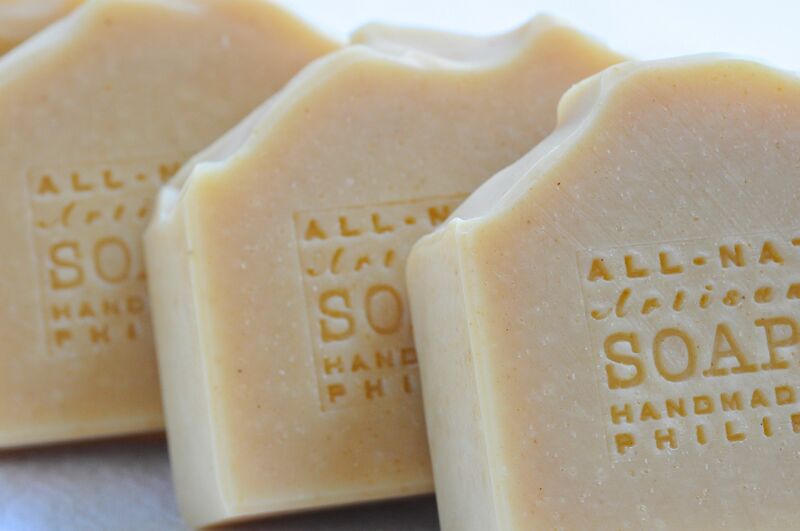 If I really wanted to, I could create a little lather by coating my hands with wet soap and rubbing them together for a few seconds. 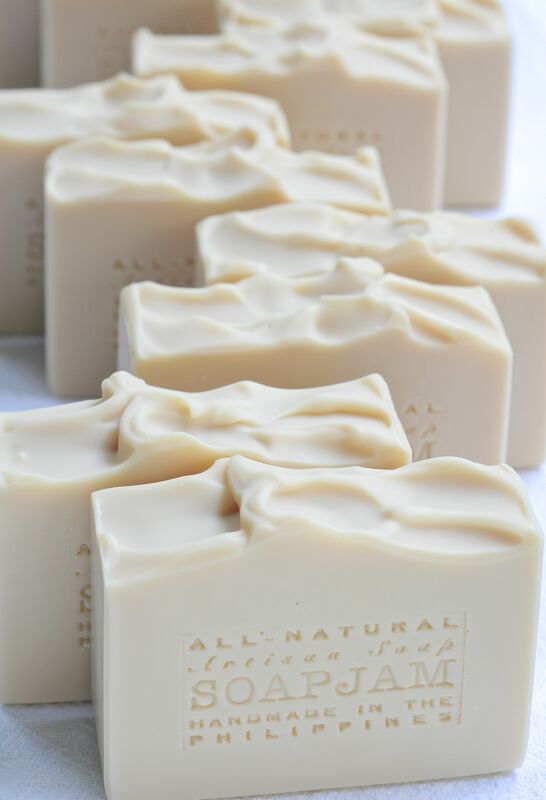 But if I just glided the bar on my body, there was no lather and the soap was so slippery that it kept jumping out of my hands. 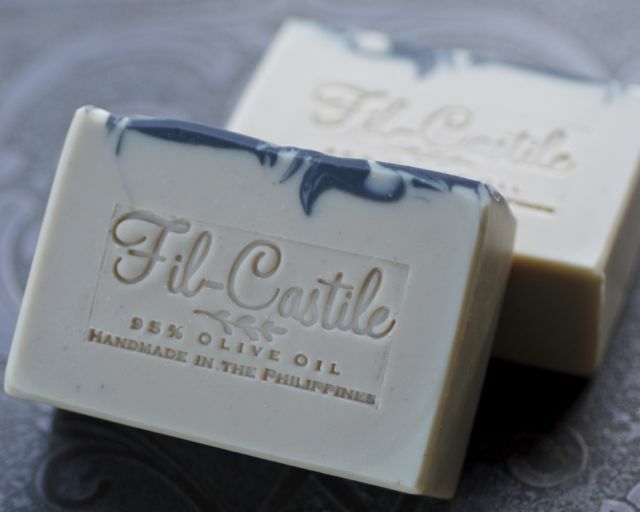 Because I like using soap with a good lather, this soap rates low in usage pleasure, but it leaves my skin feeling very soft. My conclusion is that I used the wrong type of rice, but rice water is certainly good for the skin. As for my sticky purple rice porridge, it was delicious. After cooking it and adding enough water to make it into the consistency I wanted, I seasoned it with a little himalayan salt, added coconut milk for richness, and coconut nectar for sweetness. I forgot to include it in the photos, put I also like to sprinkle it with toasted Japanese sesame seeds, either the white or black variety. Yum. 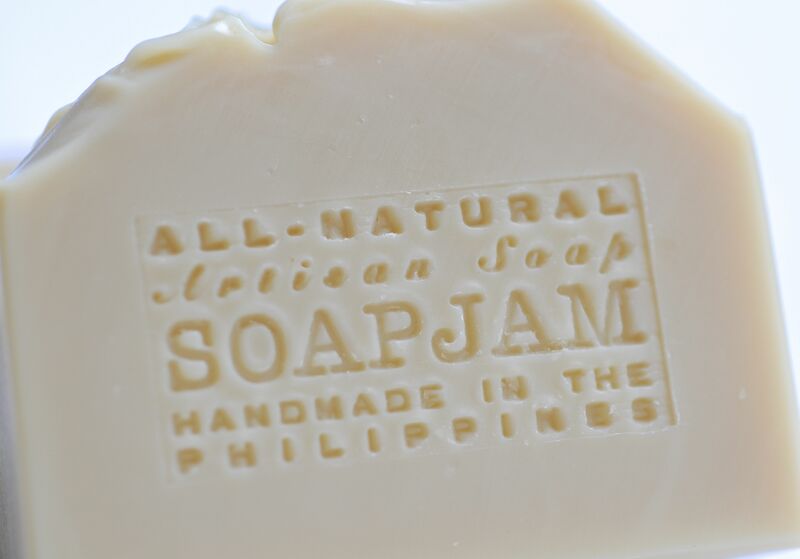 This entry was posted in All-Natural, Cold Process and tagged All-natural soap, Bamboo Charcoal, Castile Soap, Fil-Castile, Glutinous Purple Rice, rice water soap, shikon soap on March 29, 2015 by soapjam. Sitting in a dark corner of my pantry, I had shikon roots macerating in olive oil since November. It was huddled together with my collection of various infusions: calendula, mugwort, chamomile, stinging nettle, guava leaf, papaya leaf, moringa, and turmeric. A few of them have been there for over a year. Not forgotten, mind you. 🙂 The shikon infusion, with its deep rose-burgundy hue, got me the most curious. It was my first time to soap with shikon and it was fascinating to see the colour change in every step of the process. The infusion had 60 grams shikon root and 450 grams olive oil, which, after straining, formed part of a batch with a total oil weight of 1500 grams. 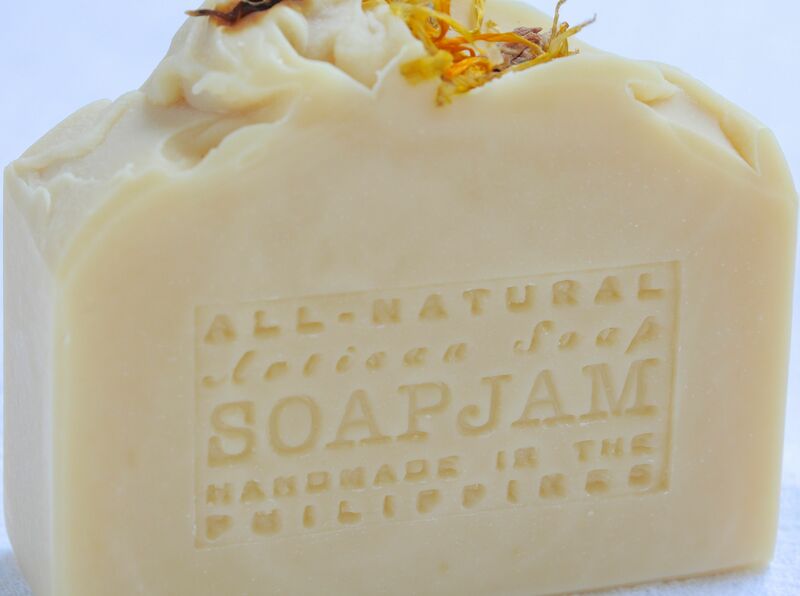 It consists of olive oil, coconut oil, macadamia oil, shea butter, fresh yogurt, goat’s milk, and and an essential oil blend of lavender, rosemary, cajeput and patchouli. 1. The colour of shikon-infused oil is a rich rose-burgundy. 2. Infused oil mixed with the other oils, yogurt and goat’s milk – before the lye was added. 3. As soon as the lye was mixed with the oils, the colour changed to a very dark purple. The white specks are from the milk, before it was properly mixed. 4. 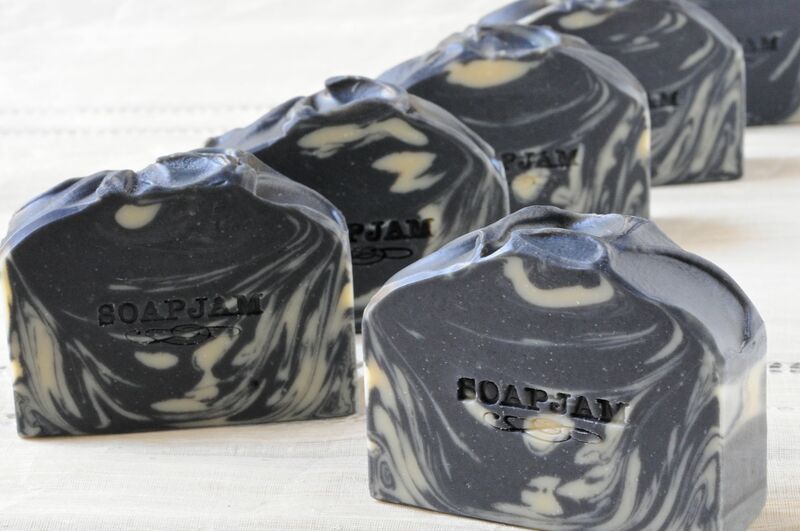 From purple, the soap batter turned into a very dark blue, nearly black. 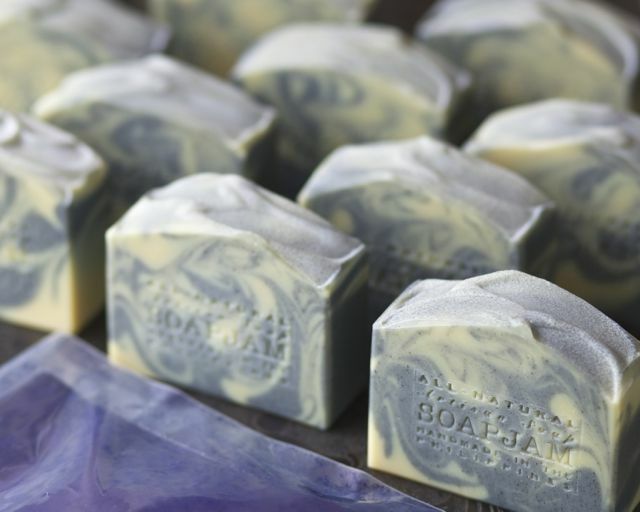 In the mold, the blue-black soap batter had morphed into blue and stayed that way even after it had dried. The black portion is coloured with bamboo charcoal. Seeing how dark blue the soap batter was, I had serious doubts that it would turn to purple or that it would lighten up. 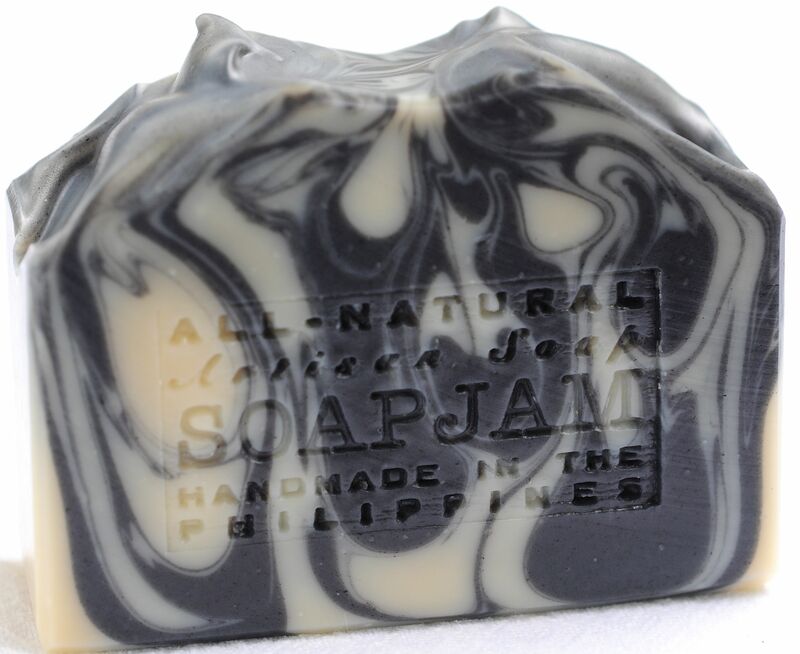 In fact, I was having second thoughts whether to continue with my plans of making bamboo charcoal swirls. 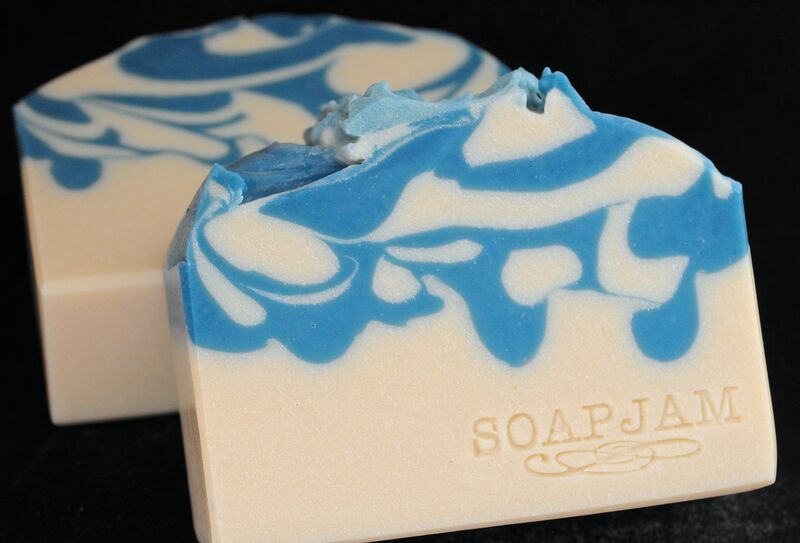 When I cut the soap, it was still blue and the inside was a muddy gray. I was honestly disappointed with the colour. But after a few minutes, I noticed that the outer edges were starting to turn purple. Half a day later, the colour had stabilised into a deep, dark purple-grey. 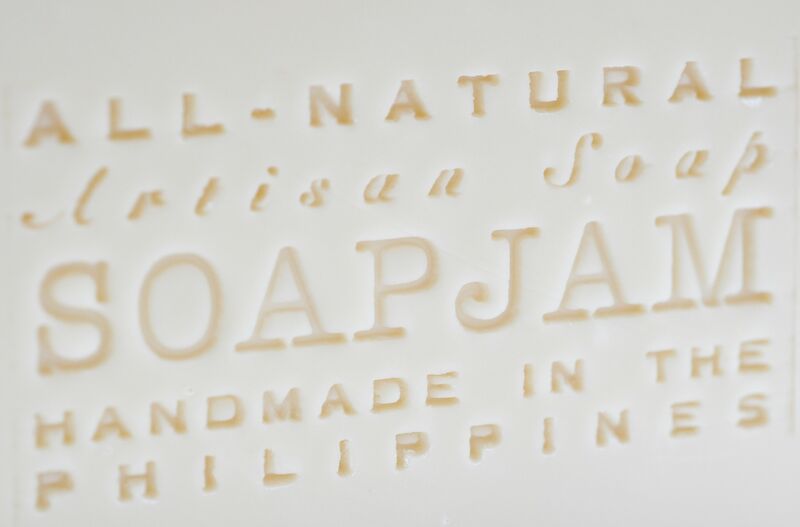 I have just started using a bar and I love the way it feels rich and creamy, with pretty good bubbles. It is quite hard considering that it contains more than 50% olive oil. There’s no salt but I added sodium lactate. 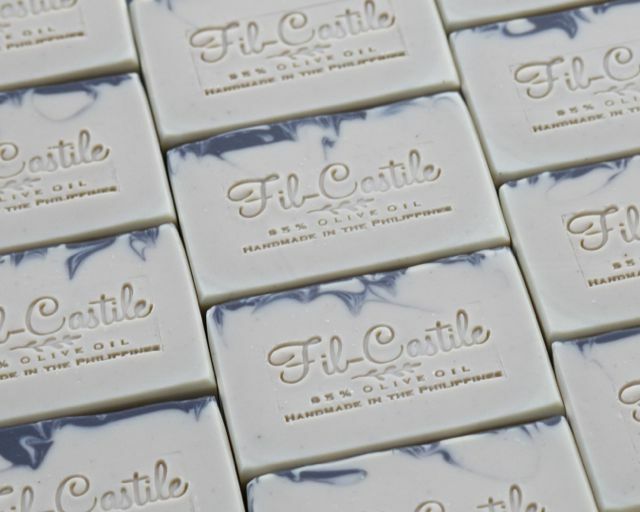 The scent is soothing and fresh, and while it makes the bathroom smell wonderful, it does not linger on the skin. The actual colour is a much darker and duller greyish purple than what the photos depict. 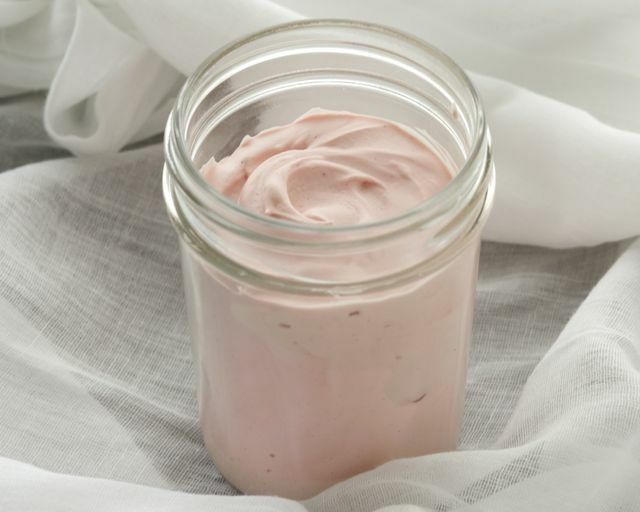 Inspired by Gordana’s body butter, I also whipped up a batch for myself, colouring it a baby pink from what I could squeeze out after straining the shikon infusion. 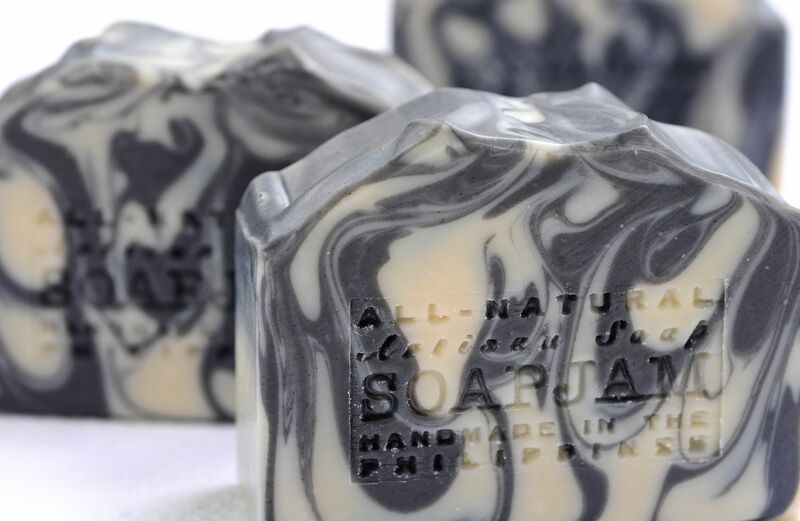 This recipe contains 70 g. raw shea butter, 10 g. guava leaf-infused coconut oil, 10 g. calendula-infused coconut oil, 10 g. shikon-infused olive oil, and a few drops of cajeput. The consistency is that of a rich buttercream! l like using it on my legs and feet, just before going to bed. Naturally pink body butter with shikon infusion. 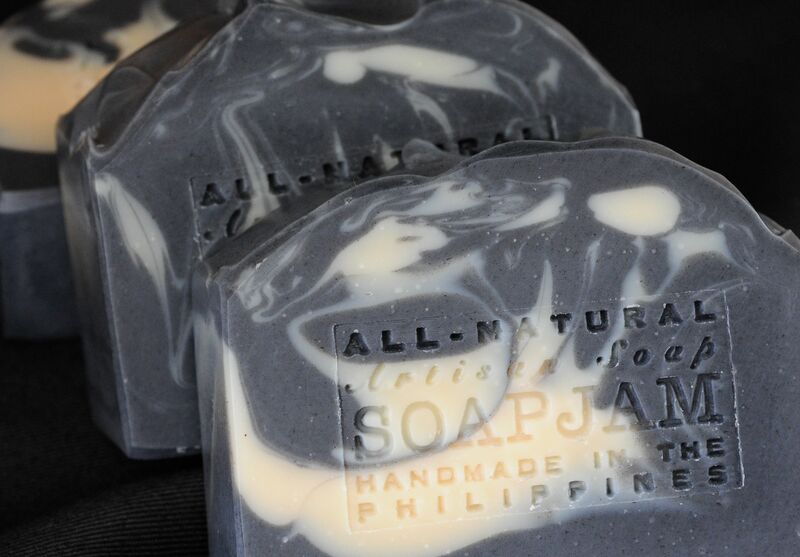 This entry was posted in All-Natural, Cold Process and tagged All-natural soap, bamboo charcoal soap, Cold Process, Lavender Soap, shikon soap on March 6, 2015 by soapjam. 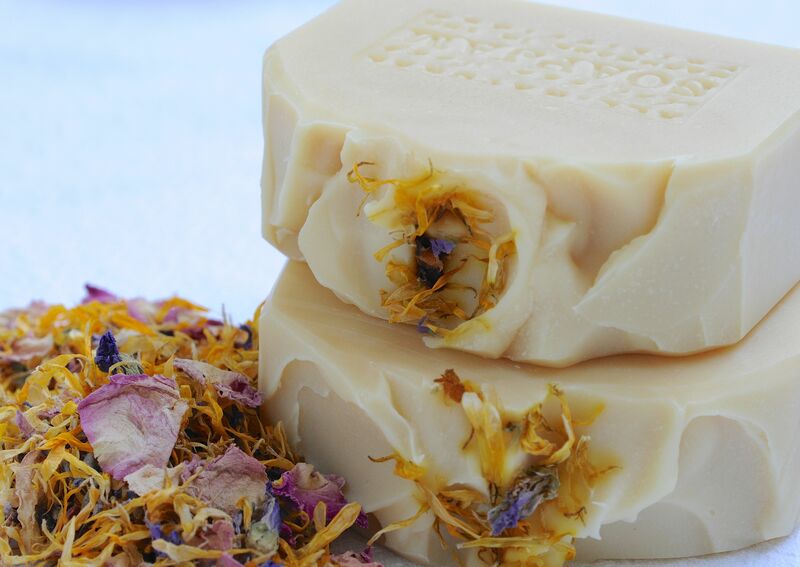 Last October, I had the pleasure of meeting Maya of Infusions (you can read about it here). She gave me some precious gifts and soaping ingredients, and one of them was Japanese indigo powder. 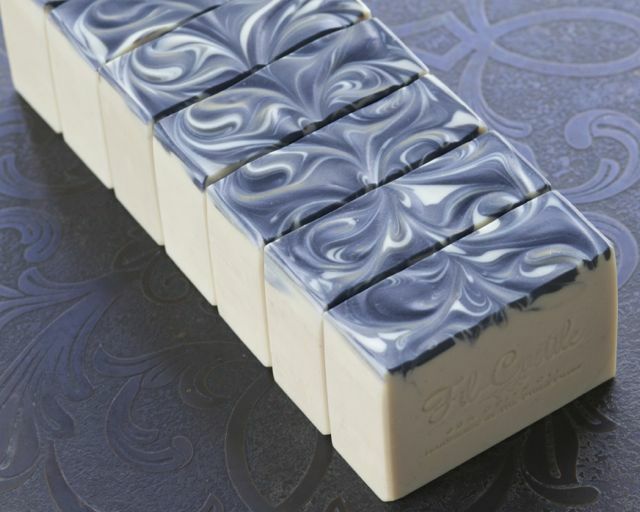 I love the colour of indigo and have always been curious to try it in soap, but had never been in possession of it until I met Maya. Now that things have quieted down after the holiday rush, I have the time to experiment with new formulae and ingredients. 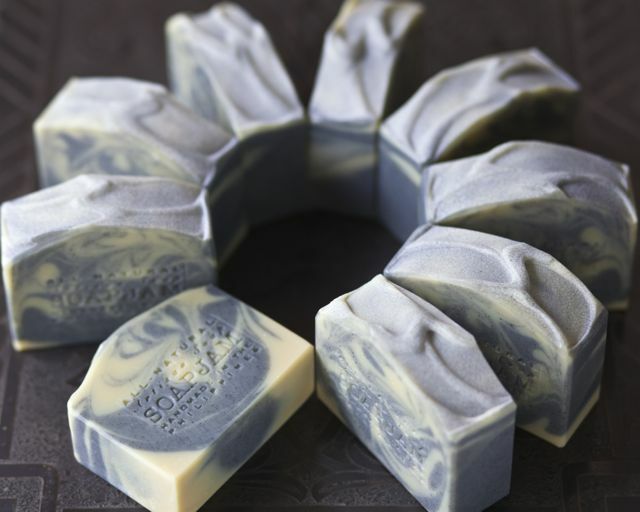 As for the indigo, I have used it after making water infusion and as powder, added directly to the soap batter and also to the lye. I used 1/2 teaspoonful of indigo powder for 12 ml hot water, infused for a couple of hours. I used about 2/3 (8 ml) of the infusion but what looked to me like a medium color may be considered dark by others. 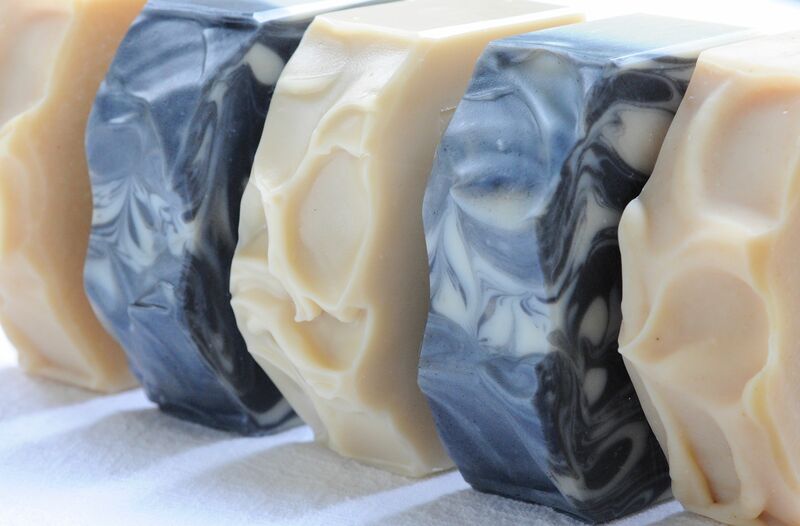 I think it is best to see the color of your batter and decide when to stop adding indigo-infused water as the color of the soap does not change much after the soap hardens. 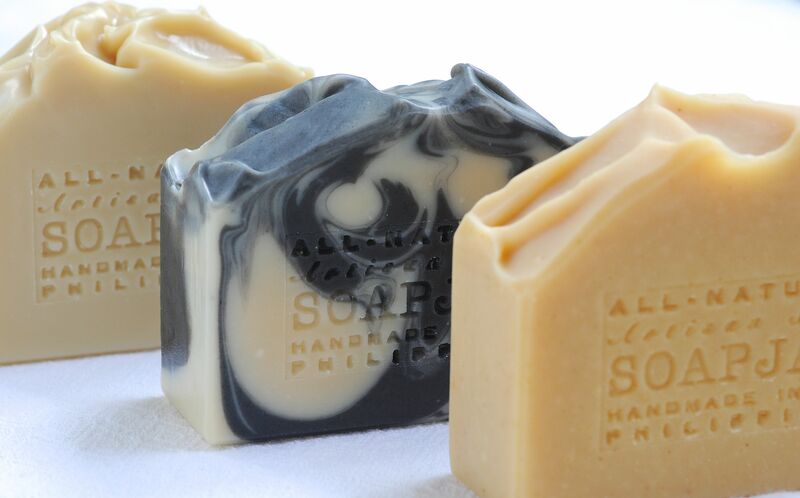 You can enhance the color by letting the soap gel. 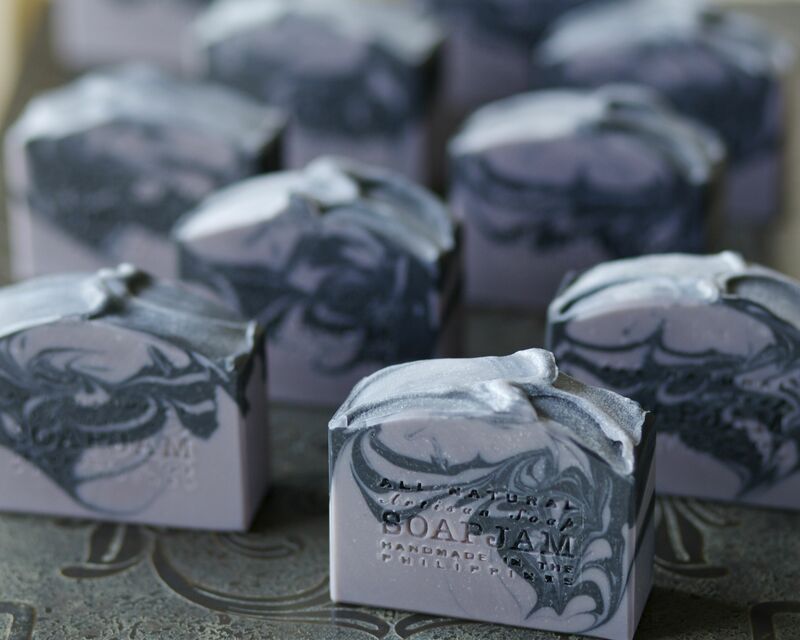 The second method, adding dry powder directly to the soap gives you a speckled look. I do not remember how much I used but you can decide the amount of powder on the go. 1. 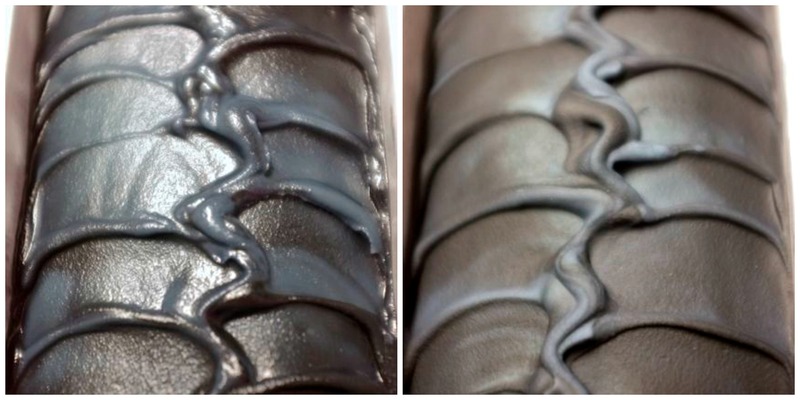 The color morphs to a very dark bluish gray if the powder is added directly to lye. 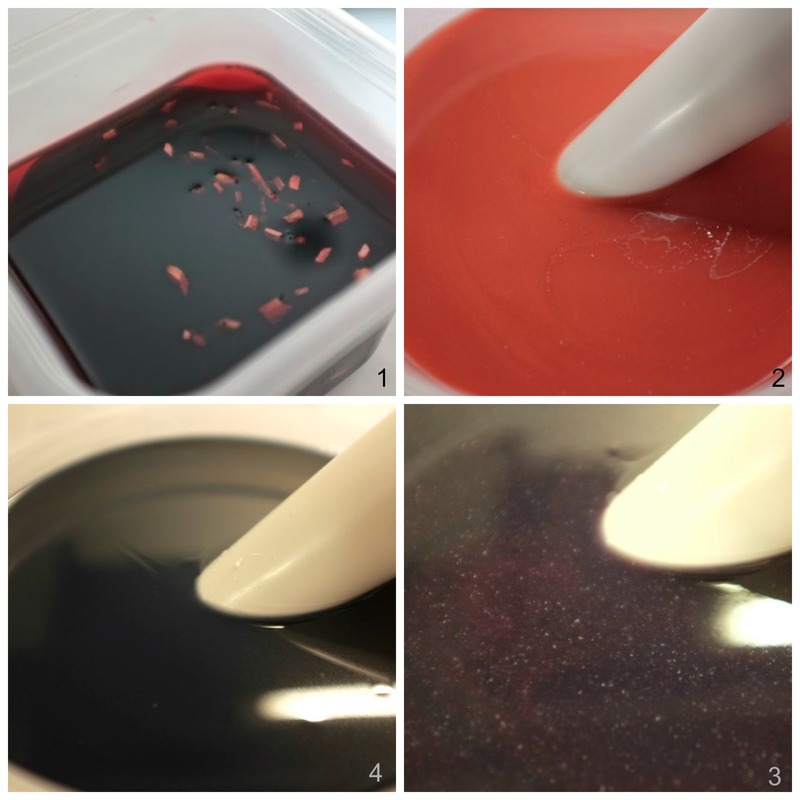 It is best to add the indigo (in whatever form) at medium trace, after the saponification has advanced and the NaOH molecules have bonded with the oil molecules and cannot react with the indigo. 2. If you use EV olive oil, you will get a deep greenish blue due to the color of the olive oil. 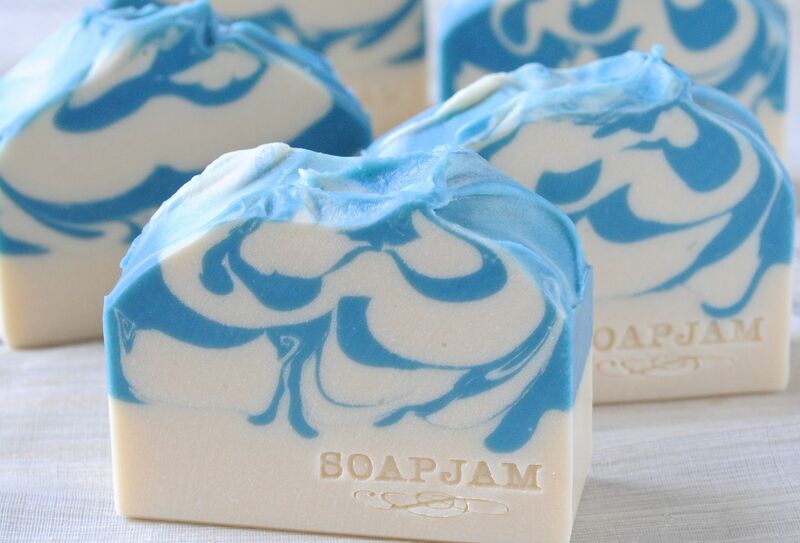 Generally speaking, the indigo color is relatively stable in CP soap but it still fades a little with time. You need to keep it in a dark place to help the retention of color. I decided to go with the first method, i.e. make a water infusion, and to add colour as needed after reaching trace. I ended up using all of my preparation, including the sediment that collected at the bottom of the glass. As you can see, the resulting colour is a bluish grey. I used olive oil, coconut oil, almond oil and cocoa butter with 2 milks: yogurt and goat’s milk. 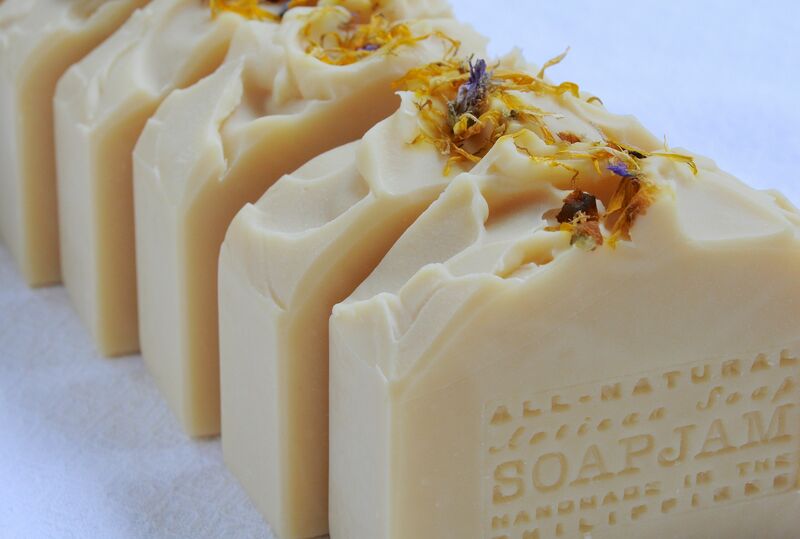 For the essential oil blend, I used cypress, petitgrain, lemon 5-fold, orange 5-fold, cajeput, and basil. It was only after mixing the EOs that I realised how yellow it was and that it would certainly have an effect on the colour. I thus used more of the EO in the uncoloured portion containing kaolin clay. Predictably, it turned yellow. It is not very obvious in the photos, but the indigo-coloured portion bleeds into the uncoloured part. The next time I make this, I will make it a solid colour. But because of the EOs, it will probably turn a greenish blue – which I don’t mind, because seriously, it smells fantastic! 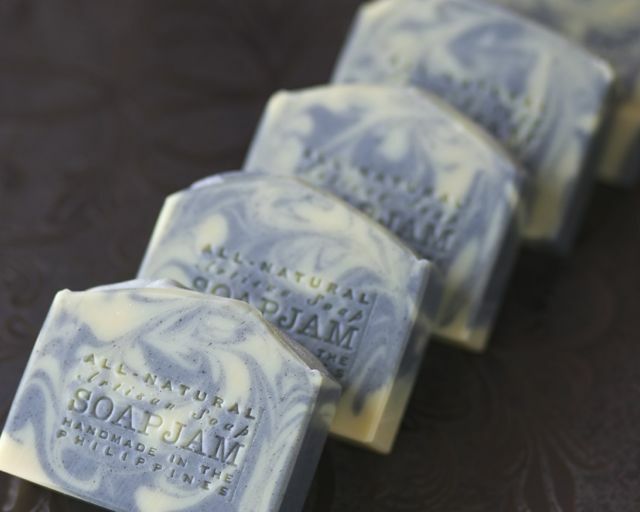 This entry was posted in All-Natural, Cold Process and tagged All-natural soap, Cold Process, Cypress Soap, Indigo Soap, Japanese Indigo, Japanese Indigo Soap on February 23, 2015 by soapjam. Here are some of my recent remakes vis-à-vis their old versions. 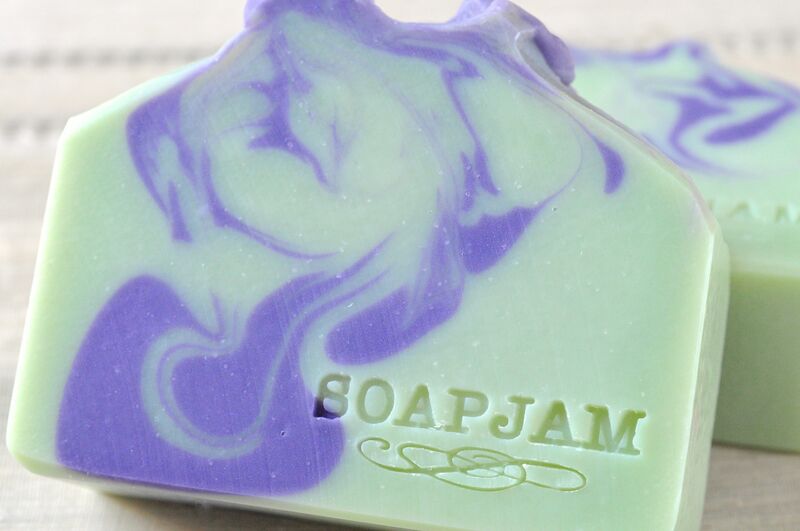 New: ITP swirl; I used the wrong stamp for this! New: very similar to the first version; the blue is a bit lighter. New: the batter was thinner than the old version so the coloured swirls went down farther. 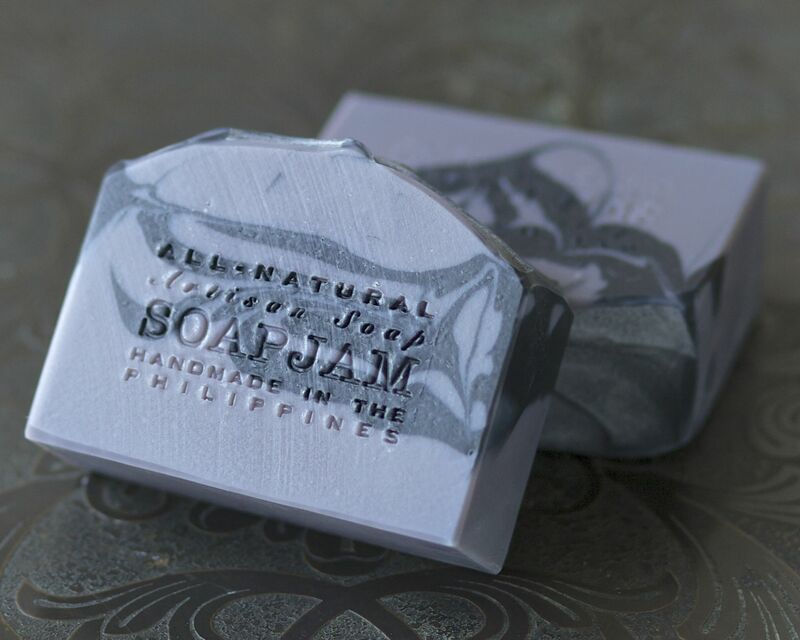 This entry was posted in All-Natural, Cold Process, Perfumed Soap and tagged All-natural soap, Berries and Violets, Bora Bora, Fir Eucalyptus Soap, Flamenco, Perfumed soaps, Tea Tree Soap on July 17, 2014 by soapjam. We’re at the height of summer and it’s sizzling hot. The internet says our temperature is 32˚C/89˚F, but it feels much hotter because of the humidity. The second floor of our house feels like an oven during midday. 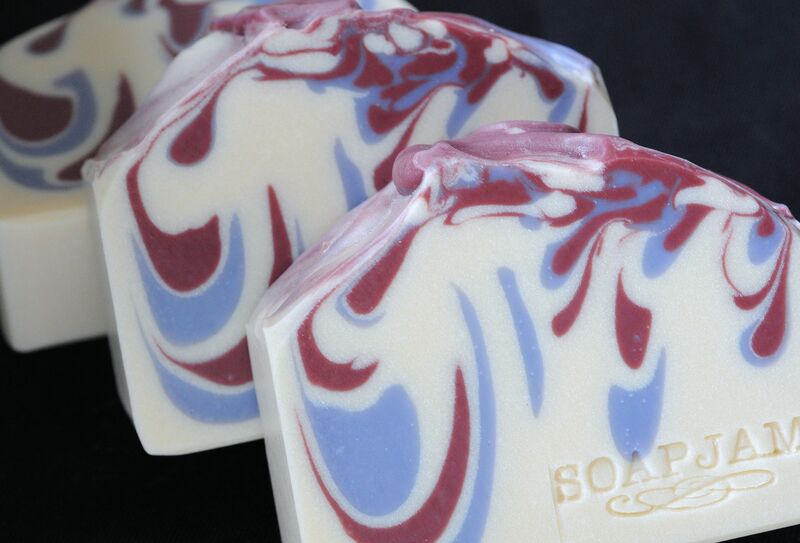 When it’s this hot, I love the cooling sensation of peppermint. It also happens to be one of my all-time favourite scents. 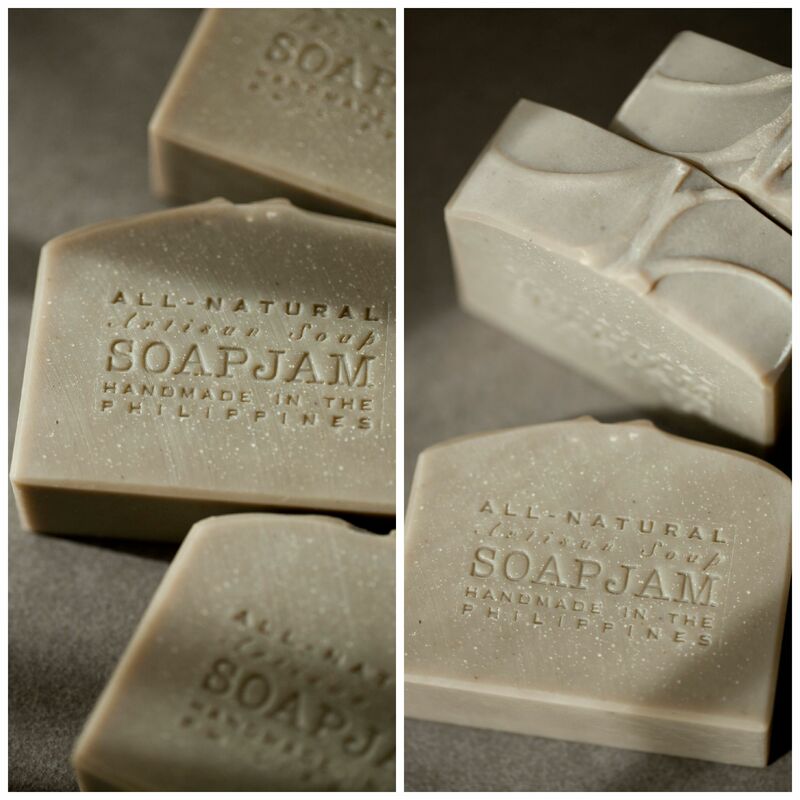 All of the soaps in this collection are combined with other essential oils to create a refreshing, mildly minty soap. I am missing a straight peppermint soap, but I’m afraid it would be too tingly. 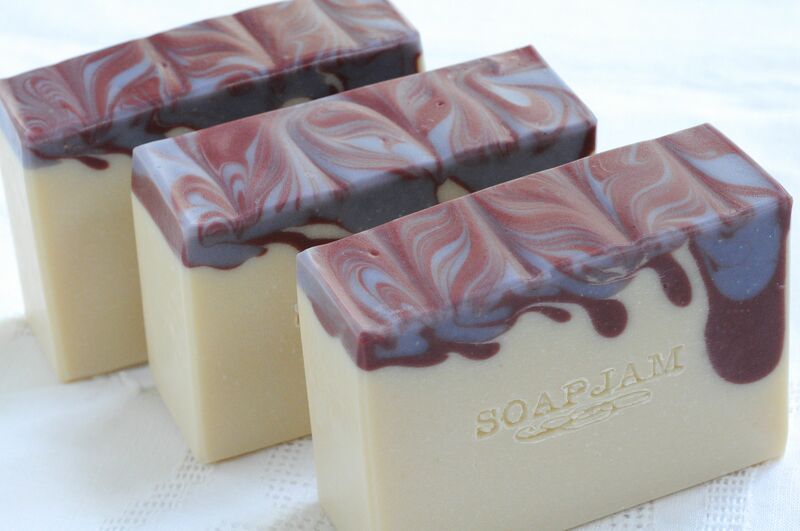 Does anyone have a suggested usage rate for peppermint in soap? 1. Lemongrass, Lime and Peppermint with Brown Rice Powder – I was a little bit worried about this because I disliked the smell of lemongrass straight out of the bottle. 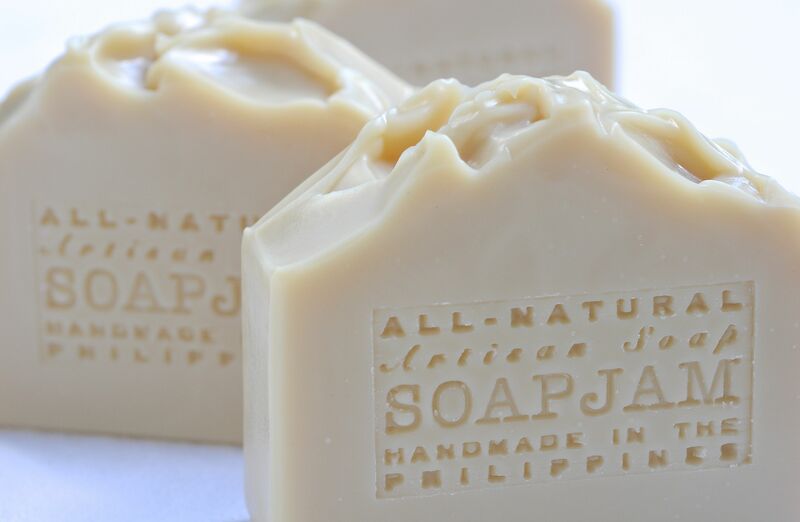 However, mixed with lime and peppermint, the scent of the lemongrass mellows out, yet still smells distinct and wonderfully fresh. It has been at least 2 weeks, and the soap remains ash-free. Yay! 2. Tea Tree, Peppermint and Spearmint with Charcoal – I find tea tree oil on its own medicinal-smelling, and Spearmint too toothpaste-like. 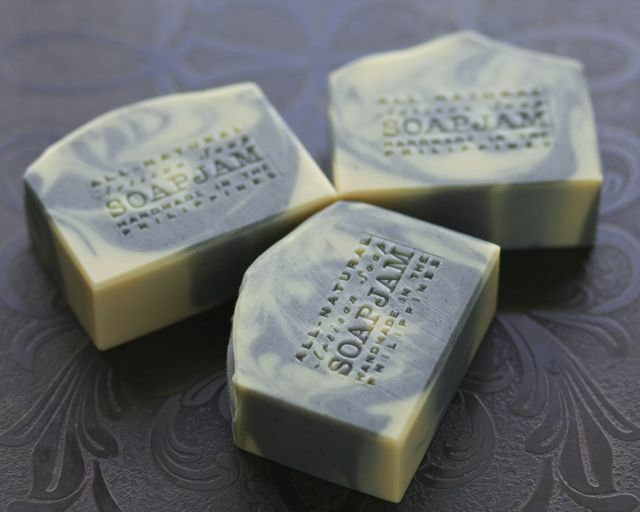 But all three mixed together, the scent is soothing with a hint of sweetness from the spearmint. 3. 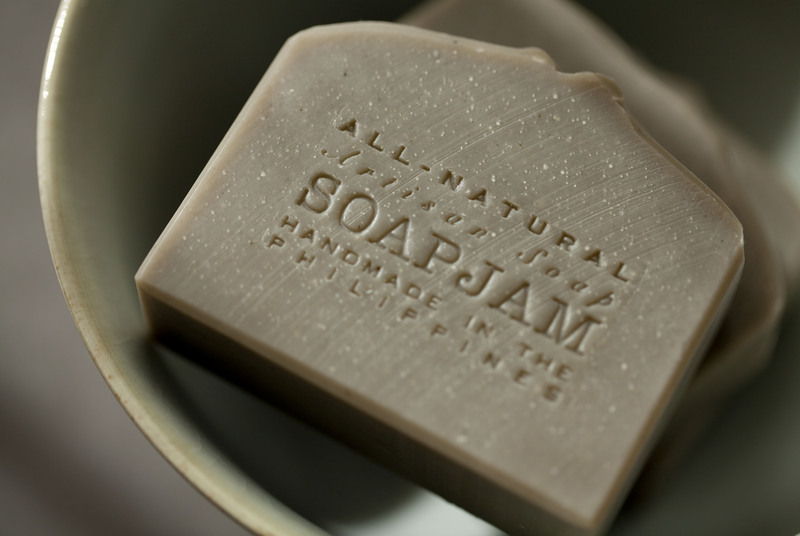 Lemon, Eucalyptus, and Peppermint with Bentonite Clay – This one smells fresh and mildly minty. 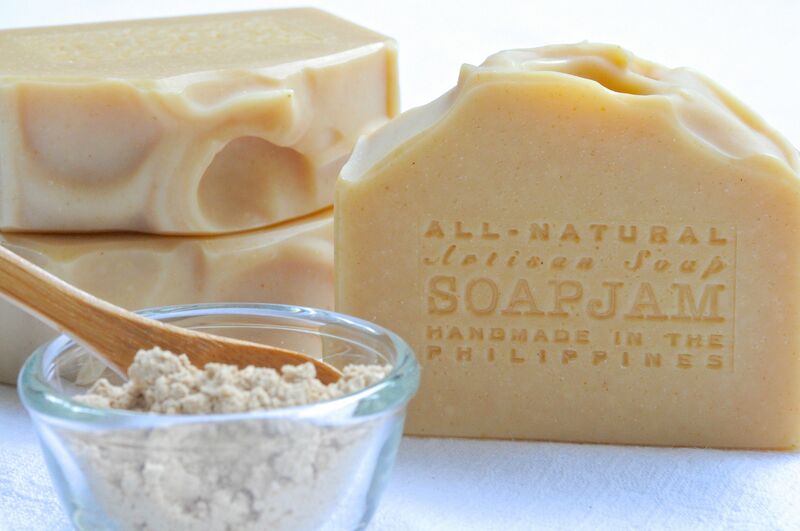 Aside from the purifying qualities of bentonite clay, I like the way it gives slip to the soap. It’s great for shaving legs. 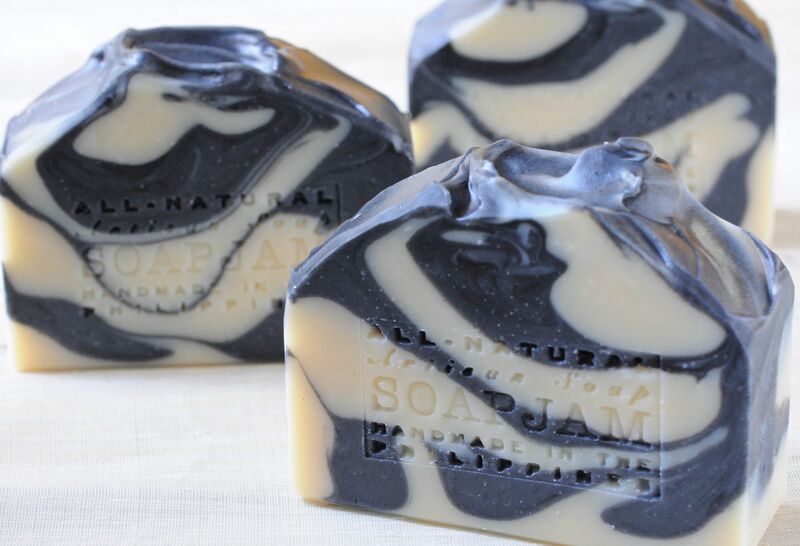 This entry was posted in All-Natural, Cold Process and tagged Activated Charcoal, All-natural soap, Bentonite Clay, Charcoal Soap, Eucalyptus Soap, Lemon Soap, Lemongrass Soap, Peppermint Soap, Spearmint Soap, Tea Tree Soap on May 1, 2014 by soapjam.